Run Time:102 Min Rated: PG (Canada) PG (MPAA) for adventure action and some mild rude humor. Building on the original film’s story of complimentary parts making a whole, and how a change of perspective can improve a person's overall outlook on life, DreamWorks’ How to Train Your Dragon 2 again focuses on themes of friendship, loyalty and acceptance. As in the first film, another big element of this film is family and family life. On the surface this sounds like boilerplate children's movie material, however it's good to remember that these themes include a complex series of grown-up concepts and ideas. These are imbedded in the film because grown-ups write children's movies. Parents watching How to Train Your Dragon 2 with their children may want to keep this in mind and be careful not to immediately recite the mantra most Hollywood producers want parents to say: "It's just a kid's movie." In How to Train Your Dragon 2 the idyllic Viking island of Berk is threatened by the mysterious Drago (Djimon Hounsou) and his rumoured dragon army. Fearing for the island's safety Hiccup (Jay Baruchel), the son of the island's Chief, sets out to try and talk reason into Drago and avert the end of Berk's now peaceful cohabitation with dragons. Along the way Hiccup is forced to deal with the prospects of leadership and some complex and unexpected family relationships. Yes, there are dragons, for the most part colourful and fun, and there are more of them than in the first film from 2010. And yes, the computer animation is world class, the voice acting strong, and the pacing is good too. Without any technical issues with the filmmaking attention moves to the story and those grown-up themes and ideas. Setting the film five years after the first film places the original characters in their late teens to early twenties, injecting the film with ideas of romantic coupling and a general interest in grown-up relationships. These range from a traditional boyfriend girlfriend relationship on the path to an engagement—as seen with the central character of Hiccup and Astrid (America Ferrera)—to the teenage 'love-sick" relationships swirling around the character of Ruffnut Thorston (Kristen Wiig) to less traditional relationships. First consider Ruffnut who shows little interest in the devotion and attentions of her male counterparts from the island of Berk spurning their advances and affections while (and this is intended to be the humorous part) she falls headlong for a minor redeemable villain, Eret son of Eret (Kit Harington) a dragon poacher working for the film’s big villain Drago. This side storyline sticks out for one particular reason: Ruffnut is shown ogling Eret's muscles as he does 'masculine' things like turning cranks and pulling levers. The camera cuts to a first-person slow-motion close-up of what Ruffnut is seeing intercut with her expressions as she gazes at Eret. This 'comical' reversal of the 'male gaze' occurs more than once and if it were reversed back to an actual 'male gaze' would easily garner the film a different rating. It's fair to say it would be deemed immediately inappropriate for a children's/family movie to contain a teenage boy ogling isolated body parts of a woman repeatedly in slow-motion close-ups regardless of whether it's intended to be humourous or not. Parents need to consider whether humour excuses this sexualization. The film also contains a brief nod to a non-traditional kind of relationship when the character Gobber (Craig Ferguson), upon watching Hicupp's mother and father argue with each other, comments "This is why I never got married ... That and one other reason." The throw-away line goes by quickly but parents may want to simply take note and be prepared to talk about this if their children ask, "Why doesn’t Gobber want to marry a girl?" The film's director and writer Dean DeBlois, who is openly gay, took Ferguson's ad-libbed line as an indication of Gobber's sexual orientation and kept it in the film. E! reports DeBlois saying "I love the idea that Gobber is Berk's resident gay." Hollywood seems very happy with the inclusion of this grown-up idea added into this children's film. Gobber's comment comes in a part of the film where Hiccup's father Stoick is seeing his wife, Valka (Cate Blanchett),again for the first time after 20 years of thinking she was dead. Valka had been carried off by a dragon in a dragon raid on the island of Berk and was presumed eaten and/or killed by the dragons. More than the brief revelation concerning Gobber, parents may want to consider thecomplex series of grown-up concepts and ideas brought into film by the addition of Hiccup's long-lost mother. At this point it will be necessary to spoil a couple plot points. The family dynamic between Hiccup and his parents is an area where How to Train Your Dragon 2 cranks up the emotional manipulation. Children whose parents are split up generally go through an intense period of desiring their parents to be together again. They hope the separation, estrangement, divorce could be whisked away and for things to be the way they were before they went sour. In short order How to Train Your Dragon 2 provides this hoped-for resolution: This is classic wish fulfillment. It will hit at the secret—or not so secret—desires of many of the film’s viewers. Twenty years melts away in minutes and they are again one big happy traditional family. Hiccup goes from not knowing his mother was still alive, to accepting her as his mother, to having his parents back together to ... what? And this is where the monkey-wrench comes in. Hollywood couldn't leave this reunited traditional family intact. At the apex of the film’s story Hiccup's father sacrifices himself to save his son even though it was his son’s disobedience that brought them to the confrontation which required the sacrifice. 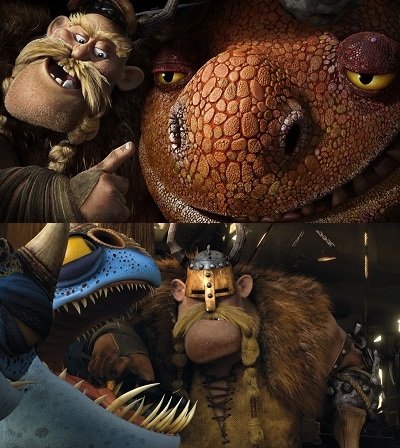 In both of the films the plot is driven by Hiccup's disobedience towards his father Stoick, who isn't just Hiccup's father but also the chief of the Vikings on the island of Berk. Some parting thoughts about the character of Stoick. Unlike King Stephan (Sharlto Copley) the clearly evil father in the recent Disney film Maleficent,Stoick is depicted as being very concerned and loving towards his son rather than self-centered or stupid. He is shown as being dedicated not only to his son but also to the people of Berk whom he governs. 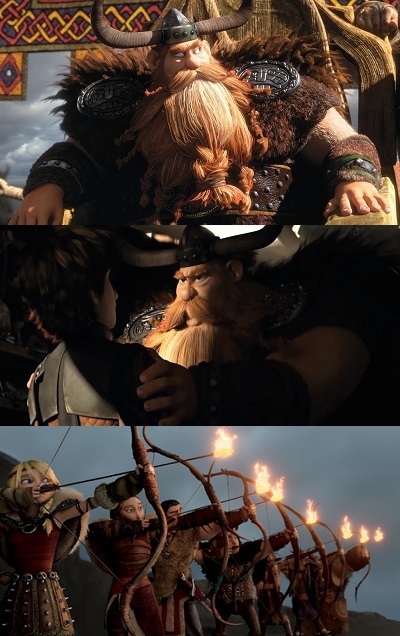 Stoick seeks his son out when Hiccup runs off, and he loves his long-lost wife with all his heart. In almost every way Stoick is very positive and surprisingly atypical for a Hollywood father character which makes it all the more puzzling as to why Hiccup is so disobedient. Gone is the Hollywood convention of making the father a jerk or dimwitted thereby providing a relativistic justification for the child's disobedience. 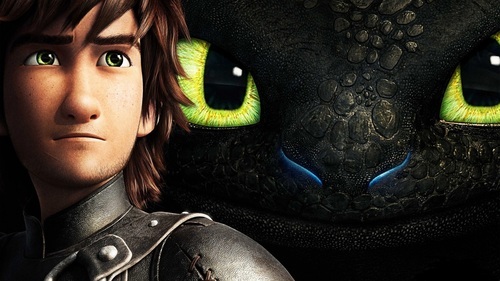 Hiccup, viewed through the lens of his father Stoik, takes on qualities of the Prodigal Son from the parable of the Lost Son told by Jesus in Luke 15, only in How to Train Your Dragon 2 Hiccup has no dutiful older brother and his father is dead before they can be entirely reconciled. Of interest is the fact that the film was released on the Father's Day weekend adding additional weight to these particular threads within the story, although the impact of Stoick's death won't likely be diminished when viewed at a later date. For the last 20 years or so Hollywood has moved away from the idea of films aimed directly at children to movies intended for the whole family. As a result, material intended for the grown-ups in the audience is added. Some believe these additions largely go over the heads of the children viewers, but one has to ask “Do they really go over their heads or do they impact the youngest of viewers.” While it is conceivable that a large number of young children could miss the implied meaning of Gobber's brief comment or not understand why Ruffnut is acting so weird around all the men who surround her, it is inconceivable that small children wouldn't pick up on the relationship between Hiccup's parents or his relationship to them as individuals. Likewise, the death of a parent in a film like this needs to be talked about as a child watching the movie won’t miss this point. With the inclusion of grown-up concepts and ideas comes the responsibility to take the opportunity to teach and talk to young viewers about modern ideas of friendship, loyalty, acceptance and family as compared and contrasted with Biblical examples. How to Train Your Dragon 2 is not a shallow film and families planning to see it—or families who have seen it already—need to look past the colourful dragons and talk about the story the film tells and the relationships it depicts. In film theory this use of the camera is often referred to as the 'male gaze' where the viewer is pressed into the active gaze of a heterosexual male as the camera takes pleasure from the act of looking at the female form in detail. This is discussed in some detail in a 1975 paper, “Visual Pleasure and Narrative Cinema” by Laura Mulvey. Film Theory and Criticism, Introductory Readings, Fourth Edition. Edited by Gerald Mast, Marshall Cohen, Leo Braudy,Oxford University Press, 1992. Pages 746-757. Mulvey comes at this from a feminist point of view, reading her article from a Biblical point of view it becomes clear that this sort of issue falls into the category of 6th Commandment, this is especially of interests across gender lines when Jesus' words from the Gospel of Matthew about adultery are applied to the concept, "But I say to you that everyone who looks at a woman with lustful intent has already committed adultery with her in his heart." (Matthew 5:28 ESV) Christians do not limit this kind of looking and the results of it to the male gender, these words are as much for women as they are for men.